Design Thinking is a solution-focused approach to problem solving. The methodology emphasizes starting with a goal and then apply solution-focused thinking converging on a future result. Alternative solutions are explored simultaneously. This is different from the analytical approach where all the parameters of the problem are analysed upfront to create a solution. Please see blog post on Design Thinking by one of my colleagues to get a better idea of the LEVER process. 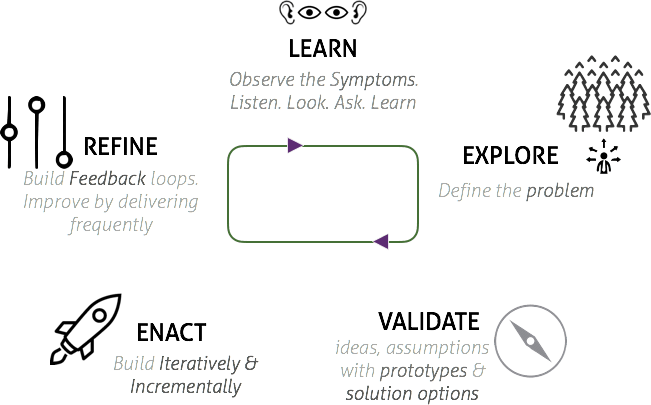 The LEV (Learn-Evaluate-Validate) cycles help people in expanding their thoughts to boxes adjacent to what they already know; Design Thinking techniques help get a diverse group of people – with multiple skills together to look at points emanating from conversations and hence review risks and opportunities closely. An IT strategy project – creation of an IT strategy for your organisation – is a good situation to apply a design thinking approach. For one, an IT strategy creation is a solution-focused process. It tries to imagine the needs of an organisation in the coming years and match it with upcoming technologies and systems to create an “ideal” solution for the organisation. It does not look to solving any current specific problem, though hopefully, any current issues will get addressed in the solution. Secondly, new, upcoming technologies and systems can be used to create new opportunities and new approaches for the organisation – opportunities and approaches that stakeholders were not even sure existed or were needed. Thirdly, an IT strategy creation is a “social” process. All stakeholders of an organisation are involved in the creation and the needs of all these stakeholders need to be addressed within the social environment of the organisation. In an IT strategy creation process, while the statement of the problems could be seemingly precise, the problems themselves can be very vague and ill-defined. Most of the time, IT strategies are built on a few goals defined in the organisation’s main strategy – goals defined by statements like “IT will provide systems to help us achieve our 10% growth.” or “IT will provide systems to increase our productivity by 20%.”. and so on. Essentially, people recognize and state symptoms, external threats – as problems. Understanding the problem is by itself a core activity of Design Thinking. It is very important to empathize with the stakeholders for who the IT strategy is being created. This is how clarity emerges from vague definitions of goals. A workshop style approach (facilitation & techniques of Design Thinking) helps stakeholders to draw out information from multiple teams, add it to their common pool of knowledge as part of Learn and Explore activities. The CEO, the sales a team and the marketing team can help get the meat around the 10% growth goal and how it can be achieved. The following interactions may happen over the course of many days. You can see the LEVER working through it. Can you get a glimpse of how this works? There is a divergence of opinions and suggestions on how the 10% growth can be achieved, there is understanding with the stakeholders, there is learning, there are a few different ideas and there is convergence on what can be done. Of course these interactions are supplemented by more formal processes like surveys, interviewing, mind-mapping etc. The IT strategy is thus slowly built up – not in a step by step manner but as a divergence convergence process. 1. The end user gets primacy of place in the process. All solutions are arrived through a empathizing process of divergence and convergence. 2. The strategy was built from harnessing the experience of many people through learning and testing. 3. 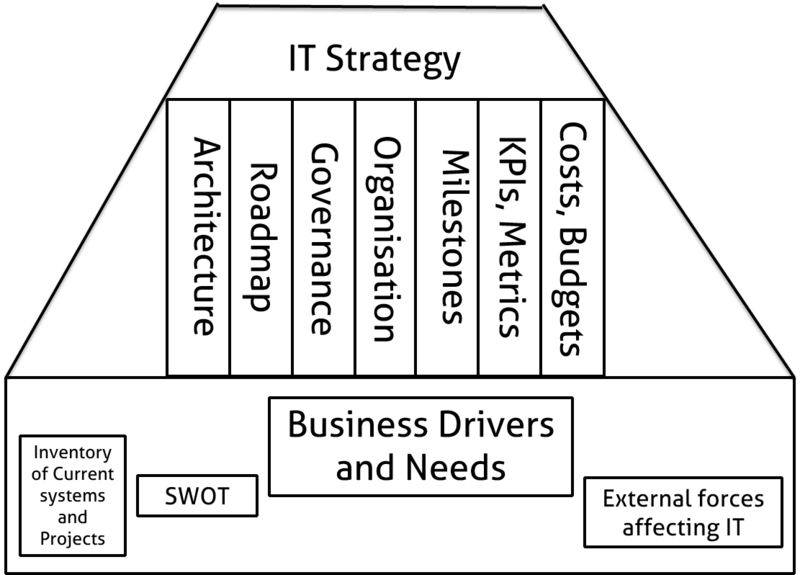 The IT strategy contains only elements that are of 100% use to the organisation. The 80% – 20% rule no longer obtains. 4. All the people involved in the process comes out the richer for the experience. They have all learned. Also note that the IT strategy created by this process will be delivered in a “live” document/documents: that is, it will be modifiable as requirements or technologies change. These changes will be easily “cascade-able” through the different levels of the strategy.